Once trades become official Wednesday, Aqib Talib will be off to the West Coast to begin a new chapter in his career with the Los Angeles Rams. He’ll be joining a secondary that features another newcomer in cornerback Marcus Peters (also acquired via trade) and one of the league’s better safeties in Lamarcus Joyner, who received the franchise tag. It shouldn’t surprise anyone that Talib is excited for what’s next. A great situation, no doubt. Talib joins a team that ranked in the top half against the pass and owned the league’s best scoring offense (29.9 points per game). A productive offense always makes a defender’s life a little easier, but what’s really enticing for the veteran is playing opposite Peters, a young, hungry, up-and-coming corner with an outspoken mean streak similar to Talib’s. “I’m not trying to make him better,” Talib said of Peters. “He had eight interceptions — he’s already cold. I’m just going to just be me. … He was one of the first guys to Facetime me. So he already a friend of mine. I already talked to him. That locker room is led by a young coach in Sean McVay, with young stars in Jared Goff and Todd Gurley. The Rams were upstart in 2017; they won’t be a surprise in 2018, especially after the flurry of recent moves made by general manager Les Snead. Those expectations are going to require some veteran leadership provided by a player with experience. Talib fits the bill. He gained that experience during his three-season run in New England and four-year stint in Denver, where he was one-fourth of the No Fly Zone. His departure has cut that group down from four to two — leaving just Chris Harris and Darian Stewart — and officially spelling the end of an era. That secondary was part of a suffocating defense that won Denver a Super Bowl. Perhaps Talib can be a senior member of another memorable defense. He already has a familiar face (Phillips) calling the shots. 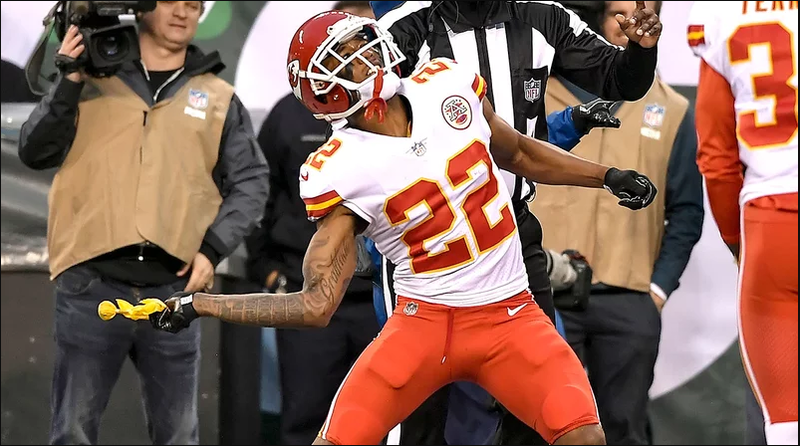 Day by day, we learn more about the Chiefs-Rams trade that netted Los Angeles a 25-year-old star cornerback, Marcus Peters. On Monday, Ian Rapoport of NFL Network reported the terms of the deal: Kansas City dealt Peters to Los Angeles for a fourth-round pick this year (the 124th overall pick) and a second-round pick next year. The compensation, even for a problem player like Peters, seemed light to me. The Rams won 11 games in 2017, and if they win a similar number next year, they’d likely have a second-round pick in the low 50s. So, let’s say Peters was acquired for the 124th pick in 2018 and 58th pick in 2019. Seems like the Rams got a heck of a deal for a 25-year-old turnover-creating machine who’s been named to two Pro Bowls in his three seasons and was All-Pro in 2016. • I’m told the Chiefs called all 31 other teams in the league this month on Peters, looking for a trade partner, and 28 teams either said they were not interested or did not make an offer of any value. For a player with the playing history of Peters at a vital and hard-to-fill position, that’s amazing. One team made an offer of a mid-round pick, laughable for a player of Peters’ age and stature. (My guess is that was Cleveland or Indianapolis.) Two were in it until the end—the Rams and 49ers. And the Rams’ offer of second- and fourth-round picks was evidently better than San Francisco’s. • The fact that a GM who knew Peters very well—Indianapolis’ Chris Ballard—did not pursue Peters hard for the Colts this month was viewed as telling by several other teams in the league. Ballard was the Chiefs’ director of player personnel in 2015, and visited Peters and his parents that spring at their Oakland home, before the draft. He was in favor of the Chiefs picking Peters, which they did in the first round of the 2015 draft, 18th overall. Clearly, Ballard would have a pipeline to the inner feelings of the Chiefs, and when he didn’t engage the Chiefs seriously, one source close to the deal said it was a telling sign. However, there is one counterpoint to this: Because the Colts are in full rebuilding mode, they’re not a great fit right now for a very good player who could be a handful, and who could leave in free agency in two years. • Those around the Chiefs saw there was life after Marcus. The team played one of its best defensive games of the season last year without Peters. He got suspended for a game by the Chiefs for freaking out on the field in a Week 13 loss at the Jets, throwing a penalty flag into the stands and stalking off the field while the game was in play though he had not been ejected. The next week, without Peters, Kansas City held Oakland to 104 total yards and no points through 48 minutes, building up a 26-0 lead. The Chiefs won the game, 26-15. • The fact that the Chiefs were calling every team in the league about Peters let teams know that Kansas City coach Andy Reid and GM Brett Veach were desperate to dump him. • Peters’ behavior had become erratic, apparently, capped by the Week 13 meltdown in the Meadowlands. The Chiefs decided they couldn’t trust his behavior anymore and, despite his playmaking ability, felt whatever they could fetch for him in trade would be better than Peters returning in 2018. • His protests during the national anthem didn’t help—at various points he raised his fist, sat on the bench and stayed in the locker room—but weren’t the driving force behind a trade. • Peters loves football. He practiced hard in Kansas City. But his tendency to lose it was a divisive part of his résumé too, and a big reason why the Chiefs dumped him. So, did the Rams make a bad trade? I don’t think so. The Rams have a defensive coordinator, Wade Phillips, who has handled high-maintenance players, and who puts great cover corners like Peters in position to maximize their ability and earning power. Peters is due $10.7 million over the next two years, very reasonable for a player who at his peak is a shutdown cornerback and one of the best in the league. So even if the Rams don’t keep him after 2019, they’ve (theoretically) paid $10.7 million over two years for a cornerback who should be supremely motivated to be great. It’s the only way he’s going to get paid Revis money. In the end, Peters’ temper and disposition probably cost him a long career in Kansas City. But talent always gets a second chance (and a third, if the talent is as big as Peters’), and the Rams are betting that Sean McVay and Phillips and a more forgiving environment will be a good new start for a very good player.